Use these trailering tips and tow your boat to gain access to new and exciting waterways. Towing a trailerable vessel is daunting to some boating enthusiasts and a snap for others, but those experienced in trailering recognize the many benefits. Hitting the road with a boat in tow unlocks access to rivers, lakes, bays, and oceans previously considered unreachable. Moreover, it’s easier to load and repair your boat when on a trailer and less expensive to re-fuel at a local gas station. (Take care to pump only marine-suitable fuel.) Then after launching the vessel at the marina ramp and into the water, it’s a quick getaway from the crowd. These trailering tips and resources will help to make your trailering experience easier and safer. 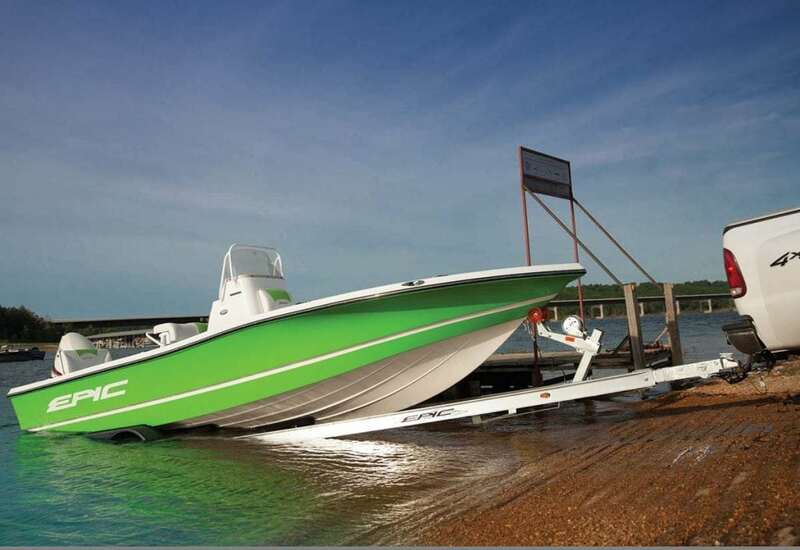 Regarding durability, boat trailers are built to take a serious amount of punishment, not only from the boat and open road but also from constant submersion into the water. But trailer maintenance is still crucial, and while freshwater is relatively benign, saltwater and brackish water is brutally corrosive. Even a tiny amount of residual saltwater could cause damage to internal parts when the trailer sits idle throughout the offseason. The initial checklist includes monitoring items such as tire air pressure, ensuring the latch is in place on the trailer ball and secured to the actuator before moving, and making sure the trailer wheels’ lug nuts are secured to manufacturer specifications. Online Towing Guide publisher Brett Becker says becoming proficient at towing takes practice and training but not while you’re at a crowded launch ramp on the weekend when the pressure is really on. “You get good at trailering the same way you get to Carnegie Hall: practice, practice, practice,” Becker says. “Focus on improving your skills each time you go boating, and pretty soon nothing about trailering will faze you.” Practice when the trailer is both empty and loaded as the change in weight can affect how the trailer responds. It’s also important to regularly review the towing rules and regulations because they are constantly changing. Each state’s Department of Motor Vehicles website offers the most current regulations, and the Online Towing Guide provides a helpful chart to determine your state’s fundamental trailering laws. When on the road, the most important function is stopping safely and under control, which means you should allow for plenty of space between you and the vehicles ahead of you. The time and distance it takes to brake increases dramatically when trailering, so doubling or even tripling the amount of space that you would normally allot between your car and the next is the safest option until you get a sense of your rig’s behavior. Mirrors also play a vital role, so consider installing larger side mirrors and convex blind-spot mirrors for supplementary safety precautions. Also, don’t be hesitant to enlist your passengers for help on the road and while maneuvering at the launch ramp. An unbalanced truck and trailer rig have a tendency to sway whether in traffic, around curves or down hills. If you begin to sway, gradually slow down and turn the wheel minimally. When you’re able to safely pull off the road, be sure to check for imbalances, tire problems, and potential mechanical failures. Trailer swaying frequently has more to do with tongue weight distribution. In most cases, the greater the tongue weight without exceeding that coupler’s capacity rating, the better the towing. The coupler linking the tow vehicle and trailer is a simple yet incredibly important connection. Always check for debris inside the coupler as any crumbs or particles could prevent the hitch ball from fully seating, which would cause an unstable connection. After attaching the coupler to the hitch ball, use the jack to try and lift it to separate the two. If it does not detach, you have a solid connection. There’s also a coupler latch that moves the collar that locks under the hitch ball, and you want to ensure that it’s lubricated and moving smoothly for safe maneuvering. The same goes for the moving parts on the tongue jack. Penetrating lubricant comes in spray cans with straw nozzles, which allows you to work fluid into the nooks and crannies. EZ Loader also offers an extension step to the trailer’s rear, making it easier to access the boat from the back. EZ Loader’s “brite steps” utilize a rail that lights up your boat’s logo, giving the boat company and/or dealer constant advertising while in tow. Newer vehicles have rearview cameras, but if your vehicle is not already equipped with one you have the option to add a portable rearview camera. Companies such as 4UCam offer a wireless magnetic portable camera and a 2.5-inch monitor. The monitor is hooked up on the dash and the camera is attached to the back of the vehicle. Both the monitor and the camera have a built-in rechargeable battery inside. The magnetic-based night vision wireless camera is used to guide you to the trailer, then easily hitch up and be on your way.